Starting today, library patrons and Amazon e-book lovers have no reason to needle each other over which source of books is superior. Or at the very least, they have a comfortable meeting place where they can (quietly) exchange both book recommendations and spirited taunting. As announced in April, Amazon now supports borrowing e-books from local libraries. Library-lent books will work on both Kindle e-readers and Kindle smartphone or tablet apps. When you borrow a Kindle public library book, you’ll have access to all the unique features of Kindle books, including real page numbers and Whispersync technology that synchronizes your notes, highlights, and last page read. After a public library book expires, if you check it out again or choose to purchase it from the Kindle store, all of your annotations and bookmarks will be preserved. Facebook and Twitter integration works too. I’m presuming Amazon’s own kindle.amazon.com social platform does as well, although the release notes don’t specify so, and I haven’t yet been able to verify it. Here’s one tricky part that turns out to not actually be so tricky. Naturally, you can’t check out books through Amazon.com. But you also can’t search to see if a book is available for library lending on Amazon’s home page, or see whether your local library is participating in Amazon’s program. If you know and regularly patronize your local library and its web page, this is no real problem. 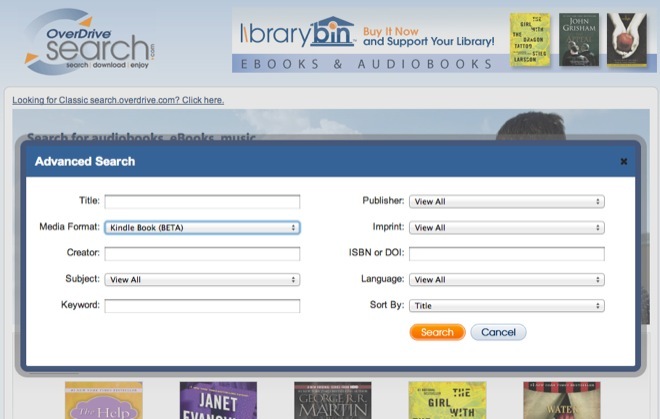 Simply go to your local library’s web site and find the digital book catalog. Use your library card (and if you don’t have one, get one) to check out the book, then click “Get for Kindle.” You’ll have to sign in to your Amazon account and have your device connected either to the internet over Wi-Fi or to your computer through a USB cable. If you’re on a 3G Kindle, smartphone, or tablet, your book won’t be delivered. What if you don’t know whether your library offers e-books at all, let alone the new Kindle books? Here it’s helpful to know that Amazon’s library lending is mediated by a third party: Overdrive. Overdrive manages digital rights for e-books in nearly every format. Plenty of other e-reader manufacturers and e-book sellers have been working with libraries to make books available already. Nearly all of them use Overdrive as a partner for its robust DRM. It mediates between the e-book manufacturers and many different kinds of institutions, particularly libraries. Your library’s web site may even have an “Overdrive” branded link rather than a Kindle one; you would then have to select which e-book format you want. It’s also a good thing, I think, for Amazon. When the Kindle was introduced, there were many people who argued that Amazon was only trying to preserve one kind of reading — direct individual purchase of popular new books — and grind every other model to dust. Now, Amazon’s much more eclectic. Whether it’s book borrowing between users, textbook rentals, libraries lending books to local patrons, or (potentially) subscription content for Amazon Prime customers, they’re experimenting with a wide range of approaches to connecting their customers to books. This partly shows Amazon’s confidence: it’s willing to engage in almost any business field or model, because it knows part of its strength is its position as an omnibus retailer who can offer anything and everything, physical and virtual. Still, this kind of experimentation, especially from a market leader, is welcome in a new market like e-books where nothing, not even Amazon’s continued role as the market leader, is certain just yet.